I’m going to try to explain what’s going on in VC. First, a story about fish. Take two groups of identical baby fish. Put one in abnormally cold water; the other, abnormally warm water. There’s a certain temperature on either end that does something interesting: Fish living in cold water will grow slower than normal, while those in warm water will grow faster than normal. Put both groups back in regular temperature water and they’ll eventually converge to become normal, full-sized adults. Fish with slowed-down growth in their early days go on to live 30% longer than average. Those with artificial super-charged growth early on die 15% earlier than average. That’s what biologists from University of Glasgow found a few years ago. “You might well expect a machine built in haste to fail quicker than one put together carefully and methodically, and our study suggests that this may be true for bodies too,” Neil Metcalfe, one of the researchers, once said. Growth is good, if only because runts eventually get eaten. But forced growth, accelerated growth, artificial growth – that tends to backfire. The same thing has been found in humans. And in birds. And in rats. But nowhere is it more obvious than in companies. 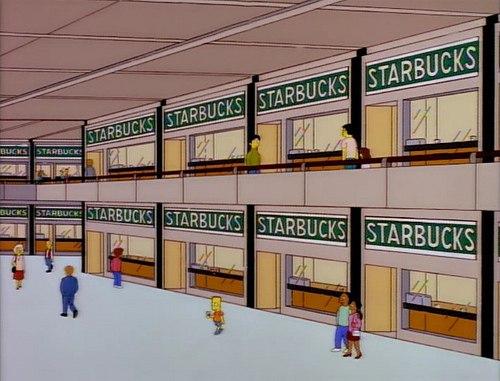 Starbucks had 425 stores in 1994, it’s 23rd year in existence. In 1999 it opened 625 new stores. By 2007 it was opening 3,500 stores per year. And, damn, did it succeed. But force-fed growth backfired. New stores were opened because there were growth targets, not because data pointed to geographic demand. Examples of Starbucks saturation became a joke. Same-store sales growth fell by half as the rest of the economy boomed. Worse, a singular focus on growth took focus away from customer experience. New food items smelled bad. Stores were redesigned for capacity, not intimacy. Drink production became industrially mechanized. The bill came due. In early 2008 Starbucks closed 600 stores and laid off 12,000 employees. Its stock fell 73%, which was awful even by 2008 standards. Charlie and I always knew that we would become incredibly wealthy. We were not in a hurry to get wealthy; we knew it would happen. Rick was just as smart as us, but he was in a hurry. Now onto what’s going on in VC. Three years ago SoFi was looking to raise a few hundred million dollars. Masayoshi Son of Softbank said he wanted to invest $1 billion, and if founder Mike Cagney didn’t take that deal, Son would invest the money in a competitor. Cagney took it. Eugene Izhikevich wanted to raise “tens of millions” for his robot startup. Softbank convinced him to take $114 million. These are extreme example. But there’s evidence that startups are taking more money than they need to succeed, usually in the name of funding bigger, faster, growth. The cost of running a startup has, in many cases, declined. From rack servers to AWS, and newspaper ads to hyper-targeted marketing. But the median seed check has increased almost 3x in the last decade, from $800K to $2.2 million, according to Correlation Ventures. A lot of this money goes to funding bigger, faster, growth. More marketing, more users, more employees, more office space. And since your competitors are playing the same game, it’s hard to not participate. Companies in winner-take-all industries have to go big. But I wonder how much relentless focus on growth at all costs will backfire. Sure, you found 25,000 users. But do they like your product enough to stick around? Cool, you got to $10 million in revenue. But do the unit economics work? Will they ever work? The main reason startups fail is because the idea didn’t work, often because it never scaled. They didn’t grow fast enough. That will always be true. But I wonder if we’ll see a new crop of companies in the coming years whose early success and ability to raise a ton of money led to massive growth goals, which in turn caused less focus on quality, profitability, and endurance than anyone wishes. It’s incumbent these days not only on founders, but the investors writing checks, to ensure you’re not putting the fish in warm water. There are no price targets, no return targets, no staking my results on a given outcome for a given company. A goalless process like this is incredibly hard to maintain in an industry which has convinced itself that the passage of three months requires that we get together and retrofit a narrative to explain what was likely pure noise. But hard as it is to maintain, I believe that a continuous process, informed by deep research, is the only way to beat Vanguard.